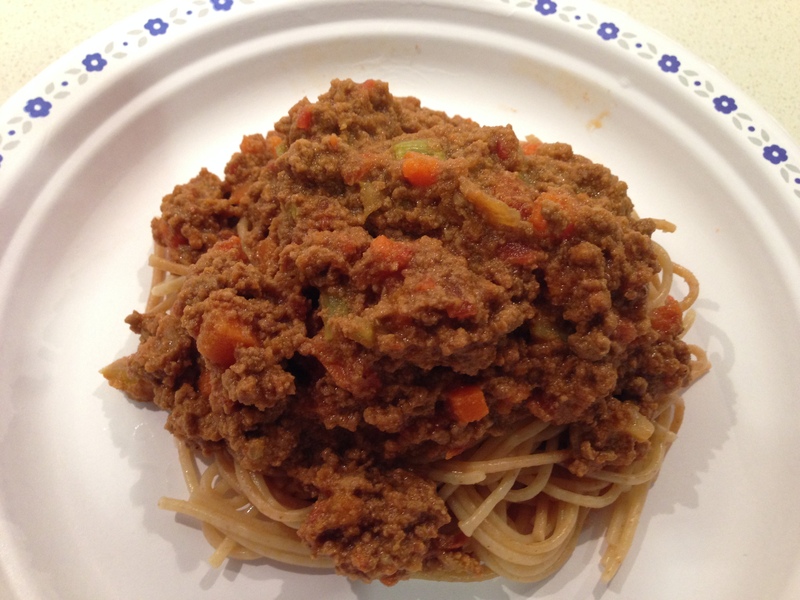 I’ve made this delicious and authentic Italian bolognese sauce twice now, and I’ve learned a few things about how to make this sauce even better. First of all, don’t use finely ground meat. You will get the best results in texture if you grind the meat yourself using a food processor fitted with a metal blade. The store ground meat ends up feeling and tasting gritty. Secondly, the quality of the canned tomatoes that you use makes a huge difference. For best results, use san marzano tomatoes if you can afford it. Though not necessary to make a delicious sauce, it will make a huge difference in tomato flavour. (I found very affordable cans of san marzano tomatoes at Costco.) Lastly, this sauce is delicious when made with lamb, too. So feel free to try making this using beef, lamb, or a combination of beef and pork. This recipe makes a large batch of sauce and is an easy way to cook for a large group. I made this for dinner for 9 people and there was enough for everyone to have seconds. The sauce is freezer friendly and the recipe can be halved. adapted from Marcella Hazan’s Essentials of Classic Italian Cooking (original recipe posted here); Note that this recipe can be halved if desired. Heat a very large stock pot over medium-high heat. Add the vegetable oil and butter. Once heated, add the onion and cook, stirring constantly, until the onions are softened and translucent. Add the ground meat. Break up the pieces of meat and cook until the meat is no longer pink in colour. Then stir in the carrots and celery. Add the milk and reduce the heat as necessary to maintain a strong simmer, uncovered. Stir frequently to prevent burning. Once the milk has completely evaporated, stir in the nutmeg and add the wine, if using. Be sure to wait until the milk has completely evaporated before adding the wine, otherwise the milk will curdle. If this happens, just keep cooking, it will still be edible and by the end of the cooking time, it will barely be noticeable. Simmer uncovered, stirring occasionally, until all of the wine has evaporated. Then add the tomatoes and reduce the heat as necessary to maintain a very gentle simmer. Stir occasionally and allow the sauce to simmer gently uncovered for 4 to 6 hours (no less than 3 hours if you’re in a rush). If the sauce starts to dry up, you can add 1/2 cup of water at a time. Add salt and pepper to taste. This sauce can be made up to 3 days in advance and then reheated prior to serving while the pasta is cooking. This sauce is also freezer friendly. Serve atop cooked pasta of your choice (i.e. spaghetti, angel hair, or fusilli) and sprinkle over freshly grated parmigiano reggiano cheese if desired. Alternatively, you could serve this sauce between burger buns.